In the last weeks the Netherlands have experienced a wave of extreme heat. 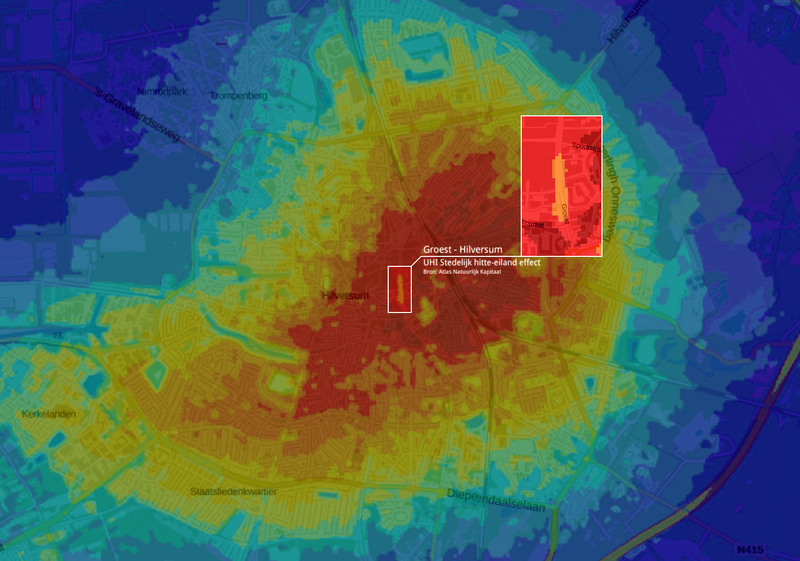 Residents of urban areas had to endure extreme heating of streets, facades and roofs, known as the ‘Urban heat island effect’. The heat that is absorbed by hard construction materials also radiates outwards at night, causing the city to hardly cool down at night. Extreme temperature difference of 15 degrees between city areas and their surrounding rural areas have been measured. This results in issues like draught, water shortages, health problems -even resulting in deaths -. Unfortunately, athough predictions are that we will experience more severe heat waves, urban heat island effect remains low on the political agenda. One of the most effective solutions can be found in planting trees and greenery in the city. Trees provide shadow both on facades and public space. They evaporate water, bind CO2 and produce oxygen. Trees and vegetation also make that the soil becomes less heated and more rooted instead, allowing for rain water to be collected more easily. Planting trees and adding greenery in the city are at the base of our working field. An extreme period like last week is an ideal moment for us to measure the performance of our past projects. 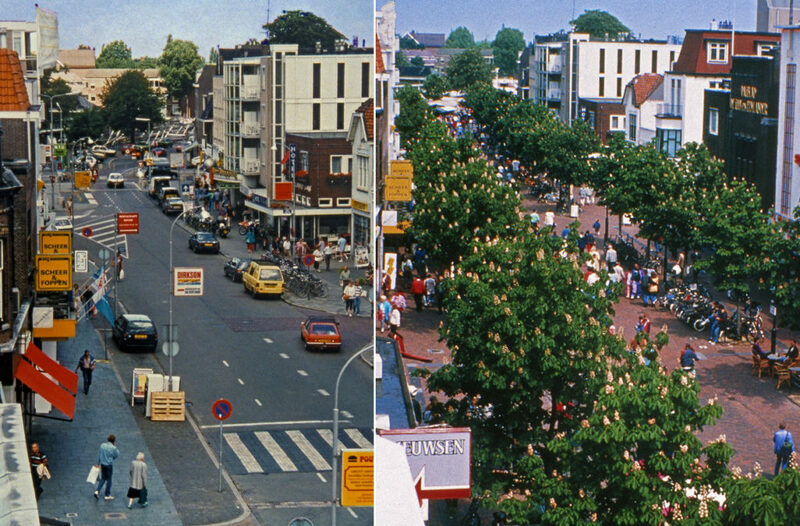 When the Groest street in Hilversum was transformed 25 years ago from a street with motorized traffic to a street for pedestrians we added a double row of trees. The heat map shows that as a result the Groest, as a shopping street, became one of the three coolest areas in the city. This makes it evident that the added value of this area is at its most effective when it is needed the most. 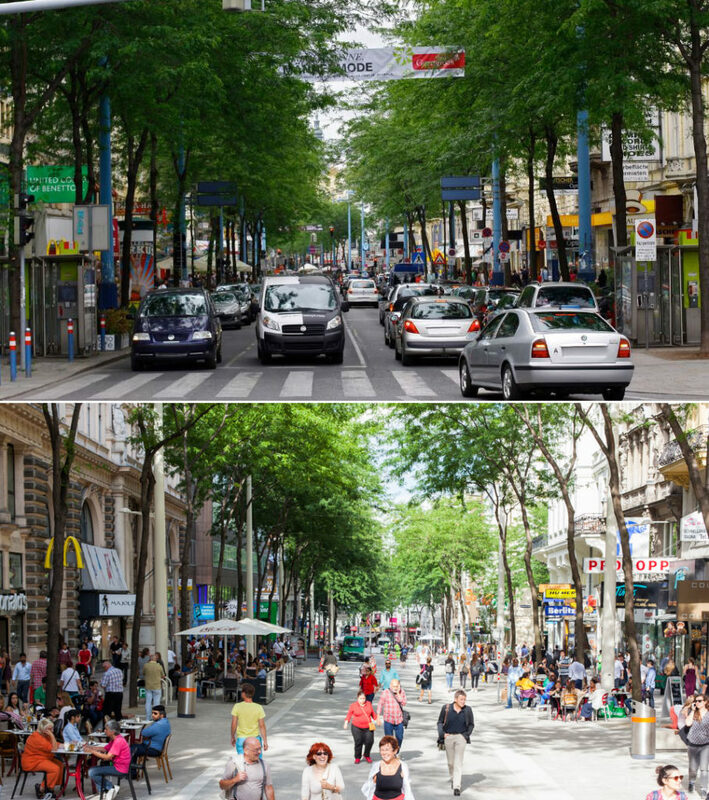 The Mariahilfer Strasse in Vienna, which was recently transformed by Bureau B+B, counts as one of the most important public spaces in the city. The Shopping street annex urban square has a tremendous attraction to urban life – even on hot days. One of the success factors of this is formed by the Gleditsia trees that were already present. This roof of leafs forms the foundation for a multi functional urban room for the city to use at all times.